We Make Digital Signage Easy! Our talented graphic artists have designed a wide variety of unique signs that are immediately available for use without any modification. Professionally designed by our distinguished team of graphic artists, the pre-designed digital signage includes motivational quotes, holiday greetings, employee communication and much more. These digital signs were specifically created to capture attention and display messages in vivid colors. Free with subscription. When a unique message is required, an EZ-PageBuilder digital sign is the perfect solution. 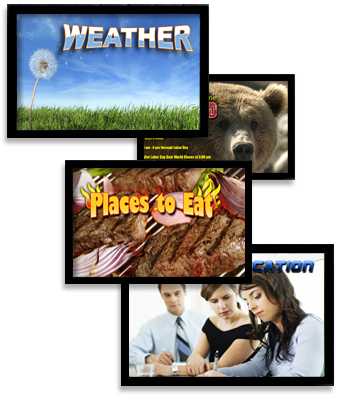 Choosing from the many EZ-DigiSign backgrounds, EZ-DigiSign customers make their own digital signage. The EZ-DigiSign backgrounds are colorful and alluring. On top of the background, text and graphics can be added anywhere on the sign with EZ-PageBuilder, an easy-to-use online software that is an online software that builds digital signage. The EZ-DigiSign design staff produces high quality, graphic rich signs that are sure to grab attention. Our professional staff of graphic artists produces custom designed digital signage that is unique, eye catching, and effective. The EZ-DigiSign design team creates digital signage that communicates messages with the perfect blend of graphics, color and text. When specific and professional signage is a must, the custom design service of EZ-DigiSign is a must. 5. Custom Designed Digital Signage. © Copyright 2016 EZ-DigiSign. All Rights Reserved.